REINADO Grand Empire Reserve receives critical acclaim and acknowledged as one of the best cigars in 2012 by three cigar industry experts. "We are delighted that the REINADO Grand Empire Reserve has been enjoyed by so many industry professionals and cigar smokers alike in just six months," said Antonio Lam, owner of Cubanero Enterprises. "Our focus has been to develop superior depth, richer undertones, and enhanced overall complexity for the palates of cigar smokers. Based upon the year-end rankings, REINADO has delivered and has been recognized alongside some of the most distinguished cigar brands in the world," said Lam. 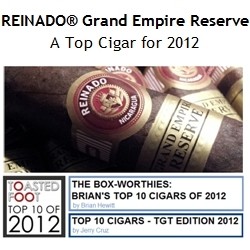 In 2013, REINADO will release the Grand Empire Reserve blend in additional targeted sizes. REINADO Cigars creates uniquely fermented, handmade premium boutique cigars that receive exceptional ratings from the cigar industry. REINADO's commitment to delivering quality products in a consistent manner are of the highest priority as the brand continues to expand its portfolio of premium cigars.